I have a habit of taking convoluted routes of reasoning in order to make connections, or perhaps more as a means to justify talking about seemingly unrelated things at the same time. I know this. And I know that today, the connections existing between content in this post are a stretch, even for me. There is an explanation, and a recipe at the end. The common thread, aside from an unshakable internal need to bring things full circle, is a question of names. All throughout pregnancy, Dave and I spent many hours tossing potential names, letting them roll and ripen over our tongues as we imagined how they might fit baby, teen, and adult. Felix took staunch hold at the top, but we were fixated on the happy, lucky meaning behind it more than we were in love with the name itself. And then, he arrived. Looking into those bright, dark eyes, there was no question. 'Felix' was perfect, like him. As for my own name, I've never been a fan. There are things I appreciate, of course. That my parents picked it, for one. Also, its Peter Pan origins and wandering nature. In my Kindergarten classroom, I didn't mind much when students found out my first name. 'Wendy' just seems to fit into Kindergarten. It has a problem growing up, however. A lot like me. I can't be the only Wendy who has struggled with Wendydom. Once in a book I read at age eight, the main character, Wendy, described her name along the lines of a "fat cat sitting on a pillow." I don't remember anything about that book except that there were horses, which I loved, and that. Aside from feeling a little put out by my first name growing up, it was a matter of severe significance that I wasn't given a middle name at birth. My parents were purposeful in their choice. They thought, rightly, that one day I would just drop it and take on my maiden name, Schuyler, as a second. For a sensitive child with a hyperactive desire to fit in, however, this would not do. It bothered me so much that in Kindergarten I lied. Or, probably more accurately, I wanted something so badly my brain changed its truth. When it came out through school records that there was no Wendy Elizabeth (everyone in my mind had the middle name Elizabeth, which made it the best), we had to trek down to the town hall to officially re-register. I was even re-baptized. Today, Elizabeth doesn't figure in any documents. I guess I just outgrew it. Speaking of outgrowing, here's what I really wanted to say in this post: I'm bidding a fond and slightly relieved farewell to 'Fit and Frugal'. 'Natural Kitchen', which is really the essence, is still here. Only now I feel more like 'we', and 'we' are 'Happy Apple'. When I first started this little journal, it was recipes, garden debacles, a ton of idle rambling, and the worst phone pictures you can imagine. I guess a lot of that still holds. But then, I was intently and passionately focused on triathlon, marathon racing, fueling sport. I'm still ardently devoted to running in particular, but my posts really aren't about fitness. As for the 'frugal' side of things, I try to prioritize economy, but at the same time, we spend a big chunk of our overall budget on food, slashing entertainment funds in favor of groceries. Being frugal is so subjective, too, and the potential for implied smugness or any sort of monetary presumption just bothers me. Happy Apple, though. It feels a happy fit, for now. Becoming a mom, I’ve reveled in the fascinating journeys and impact of healthy food in a whole new way. Sharing joyful preparation and appreciation alongside my little adventurous eater, I’ve been increasingly aware of the incredible, impact of positive role modeling. Creating and sharing nutritious, plant-based food that nourishes our active family, and even just recounting the process, I picture my little Chef's rosy apple cheeks and sparkling eyes and I feel nourished. Being his role model, I've been gentler and more loving with myself. The little face that inspires that change will change faster than I'm prepared for, but the feelings won't. Those of you who read this blog--the kind handful of you--I'm sorry if I'm throwing you off at all. It's truly just a turnabout in name and not identity. Thank you so much for checking up on us every so often, and for your presence. It sounds facetious I know, but it means a lot. And HUGE thank yous to the moon and back to Dave, patient and supportive and brilliant, for somehow squeezing in the time to re-do this site and complete the transformation. 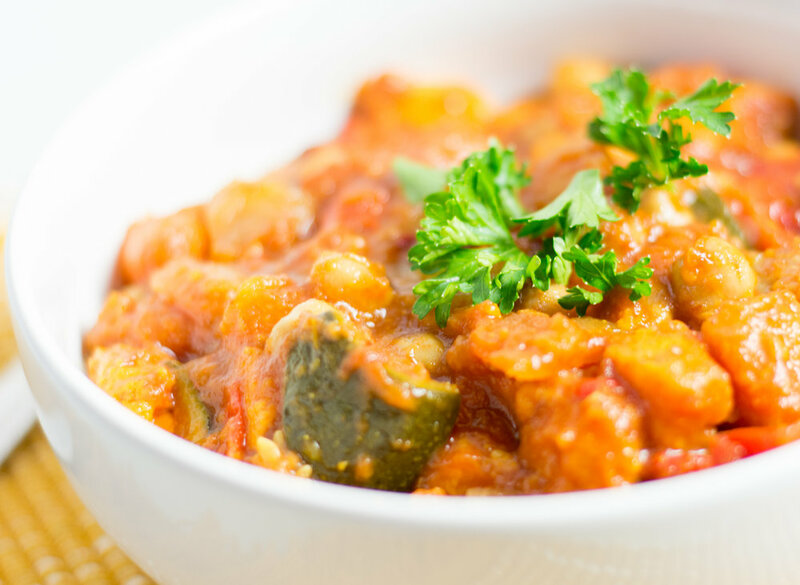 Now for the gratuitous stretch of a connection just so I can sort of justify inclusion of a recipe I've been loving and making a lot of lately: I don't really know why I call this veggie-full slow cooker sweet potato and chickpea chili 'Moroccan'. It was once based off a Moroccan Buffalo Chili recipe I saw in Clean Eating years ago, but I don't really know why that was 'Moroccan', either. I've never been to Morocco but understand the cuisine is rich in a wide range of spices. Is using some of those key spices enough to qualify a dish as 'Moroccan'? Maybe. Or maybe I just like the way adding 'Moroccan' elevates sweet potatoes, chickpeas and vegetables with a punch of something more exotic.